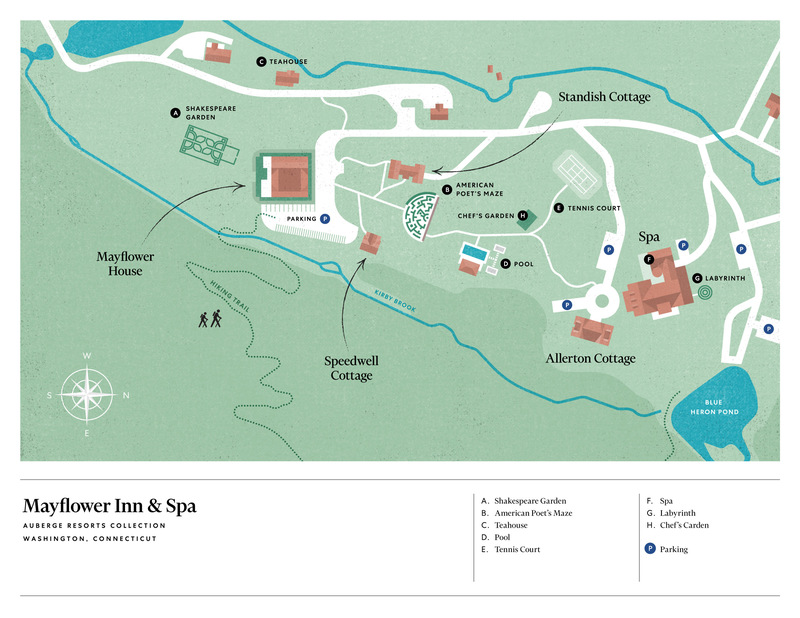 Its gathering place, both for city dwellers heeding the siren call to nature, and locals who live in the surrounding historic towns, is the Mayflower Inn & Spa. It’s nestled among 58 acres of landscaped gardens and surrounded by 3,000 acres of nature preserve, yet less than a two hours’ drive from New York City. From day trips out into the countryside for a complete immersion into nature to golfing on a championship course over picturesque greens, there's a world of wonder just a short trip away from New York. From fresh, local oysters served over ice to warm chocolate cake prepared with graham cracker ice cream and marshmallow sauce, there's something delectable for everyone. We can help you customize a special evening or any kind of private event for you and a loved one, trust us to elevate a day and really bring out the sweetness of being in love. Condé Nast Traveler 2018 Readers' Choice Awards "Top Hotels in New England"
Spacious accommodations that exemplifies the New England charm and comforts that come with residing in a luxury retreat at Mayflower Inn and Spa . They come with the added benefits of a private balcony in select suites. Bright, classic, and elegant guest rooms will transport you to a time of simple luxuries and beautiful, natural scenery. All guest rooms come with a deep soak tub to melt your troubles away. From a private naturalist-led hike through meadows, wooded ridge and wetlands and cycling along the banks of Lake Waramaug to taking a cheesemaking class at a family-run farm, the unrivaled pleasures of the Litchfield Hills await.